Thanks to everyone who attended Ride’s West Bank Transit Forum! We had a great panel discussion and a diverse set questions and answers brought up from West Bank residents. If you missed the forum or want to revisit the evening, you’ll find detailed minutes below. Thanks again to all who made this such a successful event and we’ll continue to you keep you up to date on West Bank connectivity and all things transit in New Orleans! NR: Welcome. Thanks to Alex and Justin for organizing. The city of New Orleans is poised to be a 21st century city while retaining our historic charm. Having adequate public transportation allows for ease of access to the resources offered by this city. Capacity has drastically reduced after Katrina. We are out of recovery mode and into expansion mode. One area we have not considered yet is the use of new concepts such as mini-buses. Transportation policy affects infrastructure and our environment. As a member of the city council transportation committee, I realize how these decisions will have an effect on the quality of our lives. The ferry terminal is very important to us. We hope to orchestrate a cohesive path from Quarter to the terminal. The city has also recently launched a bike share program. I’ve asked the city and the RTA to make sure that Algiers can participate in this program in a meaningful way. While ride-sharing legislation, I’ve noted the difficulty in getting ride-sharing vehicles to get to suburban areas like Algiers. I’ve also been involved in the efforts to get electric vehicles used in this city so we can see more quick-charging stations throughout the city (esp. at terminals). We have a lot of congestion in our historic areas though we have a lot of areas – especially on the west bank – that could benefit from tourism. LG: We should be thinking about what we’d like to have and how we want to see our communities grow based on the expansion of transportation system. Tell us what is currently working well regarding public transit here in the West Bank? And where do you see potential for improvement? CT: I am an Algiers resident and I take the service on average 6 days a week. One of the well things that work well is 114 and 115, esp. during rush hour. They are very timely. Going over the Crescent City bridge, there is an HOV lane that works wonderfully. KGP: Ride contacted over 400 people in Algiers. The biggest challenge to Algiers is inter-transit opportunities. We are so large and separate. We have suburban and urban issues. We really need to be smart about how we connect ourselves. The bike path that goes on top of the levee is a positive. We had really bad safety along General Myer, so to create alternative transit for cyclists and pedestrians is a win. We need to expand this path. We have to consider families and kids when we discuss Algiers. It would be really great if we had a comprehensive bike and pedestrian plan in Algiers, esp. one which focus on transit. Focus on interconnectivity with downtown. The campaign for covered bus stops has slowed, but we still need to consider them, esp. in relation to ADA accommodations and schools. JA: Our priority in 2017 is to create neighborhood circles that would create an express bus across the river, BRT on De Gaulle, and ferry connectivity. Those things are on our agenda. I can’t tell you whether we will be success re: funding, but I’ve been talking about this w the RTA for 6 months. We want to create better neighborhood circulation and optimize ferry service. 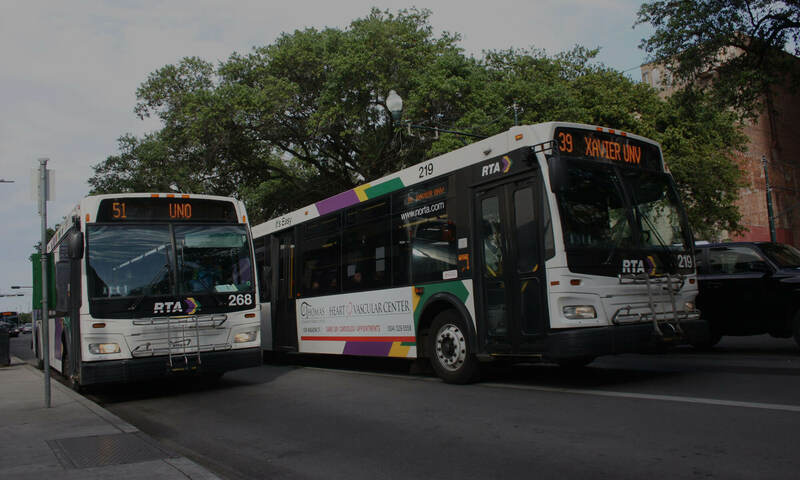 Park and ride facilities have been an eye sore since Katrina but we have been fighting FEMA – and we’re going to get that up and running so that JET buses and RTA buses can connect. Where are people traveling to? Are they able to get to where they want to go? Are we providing the necessary connections to jobs & employment centers? CT: Downtown to the CBD en route to work. 114, 115, & 106 take you downtown. There is no bus that takes you down to the Convention Center. KGP: To work and schools and the Convention Center. AM: That don’t work for everyone. KGP: The new streetcar takes you right next to the biomedical centers. Algiers is one of the closest areas to downtown that still has affordable housing. (All) West Bank residents have the unique transit options of the Algiers and Chalmette ferries. This ferry service was at risk just a couple of years ago, however, we now have plans for two new ferry boats and a new ferry terminal at the foot of Canal Street. Tell us what you would like to see in these new investments and what you would like to see in ferry service overall. CT: There’s lots of stairs to get to the ferry. These are challenges for people with disabilities. This has to be addressed. (All) Transit can be a catalyst for economic development. Where do you envision areas on the West Bank that would be ideal locations for transit corridors? And can these corridors provide new opportunities for small businesses development? JA: Access to jobs is critical. We need to improve the ferry terminal on this side of the river and the other side of the river. KPG: Just to be clear, however, there’s no funding to improve these facilities. JA: I didn’t say I had the money. We’re going to have a developer’s day sometime in April. It’s to conceptualize how developers would invest in transit on the west bank if they could. We invested $61 million on the Loyola streetcar and saw a $2.7 billion return. The west bank has the same potential – we just need to understand your thinking and your priorities, needs, desires. We don’t have all the answers. We have to outreach and listen and learn from the communities. MR: I’m a senior planning that’s a consultant to the RTA on the Strategic Mobility Plan. It’s a yearlong process that just began in January that will continue throughout this year with an aim to complete the plan by December. Mobility describes how we move around in general and the RTA is embarking on this plan as a result of all of these changes to our city and the ways in which we move around. We’re in the listening and learning phase. We begin with you. What are your needs? Aspirations? What you’d like to access and where you’d like to go? We want to make sure that we hear from you in this first phase before we come back to you with any ideas. LG: The RTA’s board members are paying attention. Raise your hand if you have a question. Remember: be clear, concise, and respectful. AM: Michelle Multz. I live in Algiers Point. The bus I take is the 101. I work at the WWII museum. In the evenings, the scheduled time between buses is an hour and ten minutes. I waited over 35 minutes for a bus. I signed up for delay notifications through the RTA website but I have not received any notifications. I need to know when my bus will be there so I can make arrangements to get home. KPG: Let’s be clear: we cannot build economic development on the west bank if we do not have connectivity. LG: Let’s hear from some other issue. AM: My name is (Inaudible). There is no shelter. If it’s been raining, they put you out on the grass. Young mothers with strollers have to stand in the grass. JA: We do not have enough shelters out here. We have not been able to put any shelters out due to the city’s comprehensive zoning ordinance. We are going to address it on the 22nd of this month with the city council committee. 1. Strategic Mobility Plan 2. Shelter Issue. We have been fighting this for 2 years. LG: Maybe we should research the zoning ordinance. MA: Any constituent interested in this is advised to show up to the Transportation City Council meeting at City Chambers at 10:30 AM on Feb 22nd. AM: Dedra Simpson. Why do we have to sign up to receive notifications? We used to be able to track the buses. I’d like that back. JA: Today the RTA has approved the purchase of a new system. You will soon be able to check the GPS of your bus, but we are working a contract it now. We probably won’t see the real impact of it until the first quarter of 2018. AM: Julius Lee. I am a president of a neighborhood council. Last meeting, on the east bank side (coming from the west bank), there used to be a crossing over the railroad tracks so that if somebody is accessing the ferry they could get around an oncoming train. JA: The new ferry terminal meeting is Feb 20. I would suggest you attend that meeting and express your concerns. AM: Keane Calloway. For the past 6 weeks, I have been riding the JET and the RTA. My actual workplace is on Rampart. The connectivity b/t buses is so delayed that I can walk from Loyola/Tulane to Rampart and see two buses behind each other. It’s awkward that I can walk 25, 30 minutes before a bus can pick me up. I’d be late for work if I wait for the bus. Is there a way to pinpoint the timing? JA: The no 1 issue we have is that we don’t have a truly regional system. My company manages both JET and RTA but we don’t collaborate. Isn’t that crazy? (enthused agreement from audience). I can’t force anything to the parish. You, the public, has to voice your concerns so that we can have everybody work together for the Strategic Mobility Plan. If we all worked together, we could create a regional system. AM: Deborah. I work at the WWII Museum. Thanks for the 5:30 bus. I can now get an earlier shift, which pays more, so thank you for that. But I don’t want to walk 8 blocks from the Convention Center to the WWII Museum. We used to have a service before the storm that would take me there. It used to take me 15 minute to get to work. Now it’s taking me 2 hours. JA: The Convention Center, the SWB, and us. You’ve these big corporations that used to only think about themselves. We had to move our stop to N Peters because we couldn’t keep a schedule, it was so congested by the Convention Center. There’s going to be a final report on how we’re going to fix transit around the Convention Center. Also, we’ve got streetcar expansion services for you to take from the UPT, go down Loyola toward Higgins. Let’s make it a pedestrian mall over by WWII so people can have increased mobility. AM: My name is Linda Martinez. I live in Algiers. I do not work downtown but I would love to go shopping downtown, and I would love to have my park and ride, go downtown, do my shopping, and come back. JA: It is on the table right now to fix the park and ride. We’re going to finalize that this year. It’s got more use and connection points that we could all benefit from. Just wait with me just a little bit longer. Now I’m fighting for expansion, for providing good stuff for the community. AM: Ralph Bradshaw, Algiers Point. I had a question about the pedestrian bridge & covered access to the bridge from Canal St (to the ferry terminal). It was mentioned that at a meeting in January. Are you going to continue pursuing a demolition permit only 24 hours after public input re: pedestrian access? JA: I went to the CPC to get a demolition permit for the bridge. It does not fit with the new plan that is being developed for Canal St. Did I answer your question? AM: Not really, but we’ll discuss it on February 20. AM: Greg Ravy, We mentor young adults in the Algiers Community. Do you work with organizations that rely on the bus? Is there anything we can do that makes it comfortable for organizations to use the bus? JA: You and I need to talk about how to figure out how to make it comfortable for young riders on the RTA. You can talk me. AM: Annette Watt, Algiers Point. Your strategic plan says you want to listen and learn. But will be an engaging process? We have been left out of this process for 2 years. It’s only been since January that we’ve been roped into the process, and some of the meetings we’ve only heard about by accident. All these people with these concerns – how are you going to engage us before these plans are really set? LG: When will people in the community get a chance to input before the design? KPG: The first public meeting was January 18. Justin, please do not mislead the public. You’ve been having 2 years of meeting with non-ridership stakeholders. Can we have your promise that the pedestrian bridge will not be demolished until we have a viable design? JA: I cannot say that. You have to separate these issues. People were voicing their opinions back in January. But that’s separate from a demolition permit. LG: I think we have a disagreement about how and when community engagement should happen. JA: The RTA has public board meetings every month. KPG: We were only able to have a design January 18. We went to the RTA Board to request to be part of a public process. AM: Ilona Prieto, Algiers Point. I take the ferry for fun. There’s no ferry reliability. Could you make sure the captain show up? It simply doesn’t work on a day to day basis. Can you make sure you include the ferry in the discussion around interconnectivity? AM: Brenda Williams, Jefferson Parish. Is there anything in the new strategic plan that will capitalize on the river? Other communities use their waterways to work for them. Is there any discussion to make sure the ferries go along the river instead of just across? JA: We bought our new boats with that consideration in mind. Re: Strategic Mobility Plan, we want to hear about what you want over the next 5, 10, 20 years. We’re trying to gather as much as data as possible. Let me apologize to you. Let me tell you about things that can shut us down: the captain doesn’t show; the coast guard can shut us down. AM: I can understand your weather point. JA: Whatever the reason may be for the ferry shutting down, I try to move buses out across the river. I don’t have a terminal on this side of the river. Schedules are designed to be as efficient as possible, but lots of things can get in the way. LG: I have to stop you and say that I am extremely proud that Algerians showed up and voiced your concerns. When someone tells you there’s a Strategic Plan, they’re not giving you a solution, just wanting to hear your concerns. AP: 1. We’ll be sending a follow-up e-mail with notes as well as meeting notes. 2. You’ve got me, Matt, and Stephanie for paid staff at Ride New Orleans. Our organization only works if everybody in this room stays in contact with us. 3. Have a little more food and have a good night! Previous PostPrevious West Bank Transit Forum this Wednesday!